Well-known for their bright eyes, pert ears and bushy tails, squirrel species have differences that are sometimes less easy to identify. 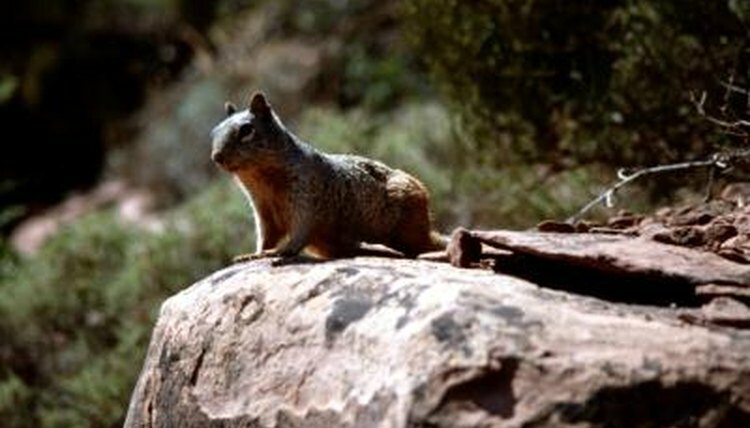 In the United States, the eastern gray squirrel is widespread, while the western gray inhabits only areas of Oregon, California and Washington. Despite being similar in appearance, the two species have different evolutionary origins. Eastern gray squirrels are related to fox squirrels and European red squirrels; the western gray's closest relatives are the Abert's squirrels of the Rocky Mountains. The eastern gray and the western gray also differ in habitat, diet and activity patterns. Western grays and eastern grays differ in size and coloring. Western grays are about 12 inches long and have 12-inch tails. Eastern grays have smaller bodies, measuring 10 1/2 inches, and 8-inch tails. Their hair is banded black, white and brown, and white-tipped, creating a very variable, gray effect. Eastern grays change color seasonally, most squirrels having a thick, gray-looking winter coat that becomes yellowish-brown in summer. Their faces, backs and tails have a reddish-brown wash; their underparts are creamy-white. Western gray squirrel coats are true gray, either a mixture of dark and light or pure steel gray, and they have white underparts and white-edged tails. Eastern gray squirrels have been successful in colonizing new habitats, while western grays are less adaptable and are threatened by habitat loss. Eastern grays live in urban, suburban, parkland and forest areas, often in close proximity to human beings. Western grays have few remaining strongholds, preferring to live in conifer and hardwood forests where oak species grow. They generally won't cross prairies and prefer to build their nests in areas of continuous tree canopy, where they can easily travel above the ground. Western and eastern gray squirrels have similar diets but eat different proportions. Both animals eat mast, or nuts and seeds of trees such as pine, hickory, oak and beech. They also eat plant shoots, caterpillars, fruit and fungi, but western grays eat more truffles and mushrooms. California western grays' diet is more than 50 percent truffles. Eastern and western grays differ slightly in their hoarding behavior. Both squirrels store mast overwinter by burying it, but western grays bury acorns and cones individually, while eastern grays bury large quantities of mast in large, communal areas. Eastern and western gray squirrels are diurnal, active during the day and at rest or asleep for most of the night, but these two species' periods of activity differ. Both species become active soon after dawn. As the day progresses, western gray squirrels alternate active and resting phases, slowing down as evening approaches. Eastern grays rest after their morning exertion and throughout the middle of the day, then resume activity before dusk. What Do Squirrel Monkeys Use as Shelter?